An ideal vaccine for induction of CD4+ T cell responses should induce local inflammation, maturation of APC, and peptide loading of MHC class II molecules. Ligation of Toll-like receptor (TLR) 2 provides the first two of these three criteria. We have studied whether targeting of TLR2 results in loading of MHC class II molecules and enhancement of CD4+ T cell responses. To dissociate MHC class II presentation from APC maturation, we have used an antagonistic, mouse anti-human TLR2 mAb (TL2.1) as ligand and measured proliferation of a mouse Cκ-specific human CD4+ T cell clone. TL2.1 mAb was 100-1000 times more efficiently presented by APC compared with isotype-matched control mAb. Moreover, TL2.1 mAb was internalized into endosomes and processed by the conventional MHC class II pathway. This novel function of TLR2 represents a link between innate and adaptive immunity and indicates that TLR2 could be a promising target for vaccines. For vaccination purposes, the induction of strong CD4+ T cell responses is of great importance. Immunization with non-self Ag alone may induce only weak responses and adjuvants are often required. Toll-like receptors (TLR)3 are pattern-recognition receptors (PRR) that bind conserved pathogen-associated molecular patterns and have a key role in innate immunity. Ten different mammalian TLR have been described with differing specificities (1), and activation of TLR results in transcription of genes encoding the inflammatory cytokines IL-1, IL-6, and TNF-α (2). We address whether TLR could also play a role in the induction of adaptive immune responses. It has previously been shown that activation of TLR4 induces up-regulation of B7.1 (CD80), a costimulatory molecule for T cells (2). Moreover, TLR2 ligands induce maturation of dendritic cells (DC) with up-regulation of MHC class II, CD80, and CD86 (3, 4) and secretion of IL-12 from monocytes and DC (5, 6). Furthermore, macrophage phagosomes are rich in TLR2 (7), suggesting that TLR2 could be internalized by means of coated vesicles. However, it is not known whether TLR2 ligands can be endocytosed and delivered to MHC class II compartments for loading and presentation to CD4+ T cells. This issue is difficult to resolve for several reasons. First, enhanced T cell responses could be due to APC maturation, increased MHC class II presentation, or both. Second, there is redundancy in interactions between natural ligands and TLR. Finally; there are no readily available T cell read-outs for natural TLR ligands. To circumvent these problems, we have here used an antagonistic TLR2-specific mAb as a ligand. Ab are processed and presented on MHC class II molecules to CD4+ T cells (8). The presentation of Ab-derived peptides is enhanced if Ab bind to endocytic receptors such as transferrin receptor (9) or DEC-205 (10) that deliver their ligands to intracellular processing compartments. Accordingly, to test whether TLR2 ligands are loaded onto MHC class II molecules, we made use of an antagonistic TLR2-specific mAb (TL2.1) and measured its potency to activate cloned mouse Cκ-specific, DR4-restricted human CD4+ T cells. The results show that TLR2 could be an efficient target for Ab-mediated delivery of MHC class II-restricted epitopes for induction of CD4+ T cell responses, even in the absence of APC maturation. TL2.1 (11) and TL2.3 (12) (both mouse IgG2a/κ) have been described. The mAb preparations were affinity purified from culture supernatant on an anti-mouse κ-Sepharose column and at 1 μg/ml free of endotoxin (detection level, 0.25 pg/ml) as measured by the limulus amebocyte lysate test. Isotype-matched control mAb (IgG2a/κ and IgG1/κ of no azide/low endotoxin standard) were purchased from BD PharMingen (San Diego, CA). 36.1 is a mouse IgG2a/λ2 mAb of unknown specificity (B. Bogen, unpublished data). mAb and reagents used for flow cytometry were: biotinylated 187.1 (anti-mouse κ L chain), anti-CD62, streptavidin-CyChrome, FITC-labeled anti-CD1a, FITC-labeled anti-CD80, PE-labeled CD86 (BD PharMingen), PE-labeled anti-HLA-DR, PE-labeled anti-CD14 (BD Biosciences, Mountain View, CA), and FITC-labeled goat anti-mouse IgG (Southern Biotechnology Associates, Birmingham, AL). Cells were double stained and 10,000 cells were run on a FACSCalibur (BD Biosciences). The hemagglutinin (HA)-(SLPKYVKQNTLKLAT) peptide was synthesized on 2-chlorotrityl resin (Senn Chemicals, Dielsdorf, Switzerland) at the University of Tübingen (Tübingen, Germany) using F-moc/OtBu chemistry and was N-terminally elongated by the K4S-pentapeptide and tripalmitoyl-S-glycerylcysteine (Pam3Cys; University of Tübingen). Identity of the peptide was confirmed by electrospray mass spectrometry and purity >85% was demonstrated by reversed-phase HPLC. The human CD4+ T cell clone (T18) specific for Cκ40–48 presented by DR4 was used as a responder cell population (13). CD14+ monocytes were purified by adherence of PBMC to culture dishes followed by washing. Monocyte-derived DC were further prepared from monocytes by culturing in GM-CSF (800 U/ml) and IL-4 (250 ng/ml; PeproTech, Rocky Hill, NJ) for 6 days, renewing cytokines every 2–3 days. On day 6, 20 ng/ml LPS (from Escherichia coli; Sigma-Aldrich, St. Louis, MO) was added to obtain mature monocyte-derived DC. Tissue culture medium was RPMI 1640 with glucose and l-glutamine (Life Technologies, Paisley, U.K.) supplemented with pooled 10% human serum from blood donors. APC were freshly isolated PBMC (7 × 104/well)- purified monocytes (5 × 104/well), immature or mature monocyte-derived DC (2 × 104/well). Various types of irradiated (20 Gy) APC and mouse Cκ-specific human CD4+ T cells (4 × 104/well) were cultured in 96-well plates with titrated amounts of the different mAb. Four hours after mAb addition, DC were matured with LPS (20 ng/ml) or Pam3Cys (1 μg/ml). After 48 h, 50 μl of supernatant was collected for cytokine measurements and the cultures were pulsed for 16–24 h with 1 μCi [3H]TdR. The cultures were harvested and [3H]TdR incorporated into DNA of proliferating cells was measured using a Matrix 96 beta counter (Packard, Meriden, CT). Concentrations of IFN-γ in the culture supernatants were quantified by sandwich ELISA (Quantikine; R&D Systems, Oxon, U.K.), whereas concentrations of TNF-α were measured by OptEIA ELISA kit (BD PharMingen). Ca2+ mobilization measurements were performed as previously described (14). Briefly, rested T18 CD4+ T cells were incubated with 5 μM fura2-axetoxymethyl ester (fura2-AM; Teflabs, Austin TX) and resuspended in HEPES salt solution (10 mM HEPES and 11 mM d-glucose). Glass cover slips with vertically attached polyethylene cylinders were sterilized by UV treatment for 6 h, PBMC (2, 5 × 106) were added, and a semiconfluent layer of monocytes was allowed to adhere. TL2.1 mAb (100 μg/ml) was added in the presence or absence of brefeldin A (500 μM), chloroquine (10 μM), or leupeptin (5 μg/ml; Sigma-Aldrich). The cells were incubated for 2 or 4 h at 37°C before washing and fura2-AM-loaded T cells (5 × 105/w) were carefully added and allowed to sediment onto the layer of mAb-pulsed monocytes. The imaging and registration software were as described elsewhere (14). Statistical analyses were computed by using SPSS for Windows (Chicago, IL). Differences in the concentration of free cytosolic Ca2+ in the absence and presence of brefeldin A, chloroquine, or leupeptin were compared using Student’s t test (significant level at p < 0.01). HEK293 cells stably expressing transfected TLR2 were seeded in 35-mm glass-bottom culture dishes and transiently transfected with FYVE-green fluorescent protein (GFP,1 pg/dish, generously provided by Dr. Stenmark (15)) using Genejuice transfection agent (Novagen, Madison, WI). The next day cells were labeled with Alexa546-conjugated TL2.1 (anti-TLR2, IgG2a/κ) or Alexa546-conjugated HTA125 (anti-TLR4, IgG2a/κ, 10 μg/ml) at room temperature for 45 min. Cells were washed and stained with the red fluorescent cell-permeable DNA probe DRAQ5 (0.5 μM; Biostatys, Leichershire, U.K.). Cells were observed using a Zeiss Axiovert 100-M inverted microscope (Zeiss, Oberkochen, Germany) equipped with a LSM 510 laser scanning unit. The TLR2-specific mAb (TL2.1) stained CD14+ monocytes, immature DC, and mature DC although TLR2 expression was down-regulated with maturation (Fig. 1⇓A). It has previously been shown that TL2.1 mAb fail to induce IL-6 in monocytes (11). We show here that TL2.1 fail to induce secretion of TNF-α from monocytes and immature DC, while the natural TLR2 and TLR4 ligands Pam3Cys and LPS did (Fig. 1⇓B). LPS-matured DC responded poorly to all ligands except a weak response to LPS. Moreover, TL2.1 did not up-regulate CD80, CD86, or MHC class II molecules on monocytes or DC after 4, 24, or 40 h (Fig. 1⇓C and data not shown). Furthermore, TL2.1 mAb does not induce NF-κB translocation in Chinese hamster ovary cells transfected with TLR2 (E. Latz and T. Espevik, unpublished data). Thus, in the absence of APC maturation, the TL2.1 mAb could be used to examine whether TLR2 ligands are internalized via receptor-mediated endocytosis and efficiently load peptides onto MHC class II molecules. The TLR2-specific mAb TL2.1 failed to induce secretion of TNF-α and maturation of APC. A, Staining of monocytes (left), immature (middle), and mature DC (right) by TLR2-specific mAb. B, Monocytes, immature DC, or mature DC were incubated for 16 h with TL2.1 (10 μg/ml), isotype-matched control mAb (10 μg/ml), LPS (20 ng/ml), or Pam3Cys (1 μg/ml). TNF-α was measured by ELISA. Data are illustrated as mean of triplicates and error bars indicate SEM. C, Monocytes (upper) or immature DC (lower) were incubated with TL2.1 mAb (10 μg/ml), isotype-matched control mAb (10 μg/ml), or LPS (20 ng/ml) for 40 h before flow cytometric analysis. Open histograms, control IgG2a mAb; dark histograms, TL2.1 mAb, LPS, or Pam3Cys; light shaded histograms, isotype-matched controls for anti-CD80/CD86 staining. When using PBMC (Fig. 2⇓A), monocytes (Fig. 2⇓B), or highly endocytic immature DC (Fig. 2⇓C) as APC TLR2-specific mAb (TL2.1) was 100-1000 times more efficient at inducing T cell proliferation than isotype-matched control mAb with irrelevant specificity, the latter being a control for contribution by FcR-mediated uptake. Maturation of immature DC by addition of either LPS or Pam3Cys gave similar results (Fig. 2⇓C and data not shown). However, if DC were LPS matured for 1 day before addition of mAb, the efficiency measured by dose-response curves and the cpm values were reduced (Fig. 2⇓D), as would be expected because the endocytic activity is diminished and because TLR2 expression is reduced (Fig. 1⇑A). It should be noted that T cell responses were obtained with 0.01 μg/ml TL2.1, which is 1000-fold less than that used in Fig. 1⇑C and which failed to induce any activation or maturation of APC. mAb specific for CD62 ligand, highly expressed on monocytes (data not shown), was not more efficient than control mAb (Fig. 2⇓B). Similarly, anti-CXCR1 mAb that stained monocytes was not presented at levels above isotype-matched controls (data not shown). These results imply that only a subset of cell surface receptors channel Ag into the MHC class II presentation pathway. mAb targeted to TLR2 on various APC are efficiently presented on MHC class II molecules to CD4+ T cells. 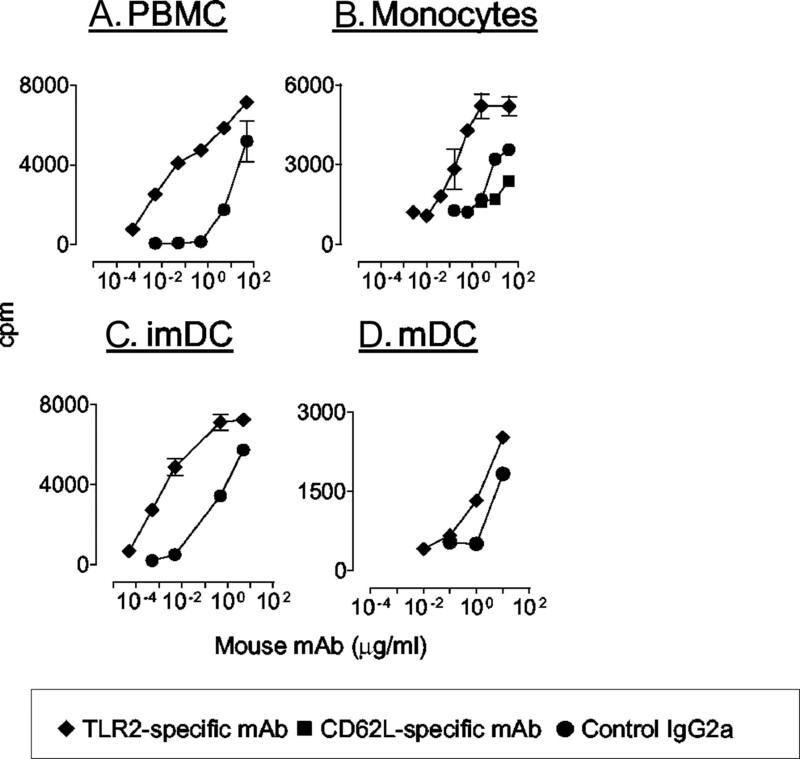 PBMC (A), monocytes (B), immature DC (C), or mature DC (D) were cultured with titrated amounts of mouse mAb specific for TLR2 or control mAb and cloned DR4-restricted CD4+ T cells specific for mouse Cκ40–48. Proliferation of T cells was measured between 48 and 72 h by incorporation of [3H]TdR. Similar results as for TL2.1 were obtained when using another TLR2-specific mAb TL2.3 (data not shown). TL2.3 binds a determinant on TLR2 distinct from that bound by TL2.1 used otherwise in this report, suggesting that distinct epitopes on TLR2 are capable of directing mAb into the MHC class II presentation pathway. In all experiments, T cell activation was also measured as production of IFN-γ and the results were consistent with the proliferation data (data not shown). We next studied the requirements for Ag processing of TL2.1 mAb before presentation. Chloroquine inhibits acidification of lysosomes necessary for proteolysis of proteins, leupeptin is a cysteine protease inhibitor, whereas brefeldin A induces fusion of Golgi and endoplasmic reticulum, and in this way inhibits egress of newly synthesized MHC class II molecules. Because the presence of such reagents could adversely affect APC or T cells, a short-term assay was used in which only APC were exposed to the agents. Monocytes were incubated with mAb and the drugs for 4 h before washings, followed by addition of fura2-AM-loaded T cells. T cell activation was measured within minutes as increase in free cytosolic Ca2+ in single Cκ-specific cloned CD4+ T cells. 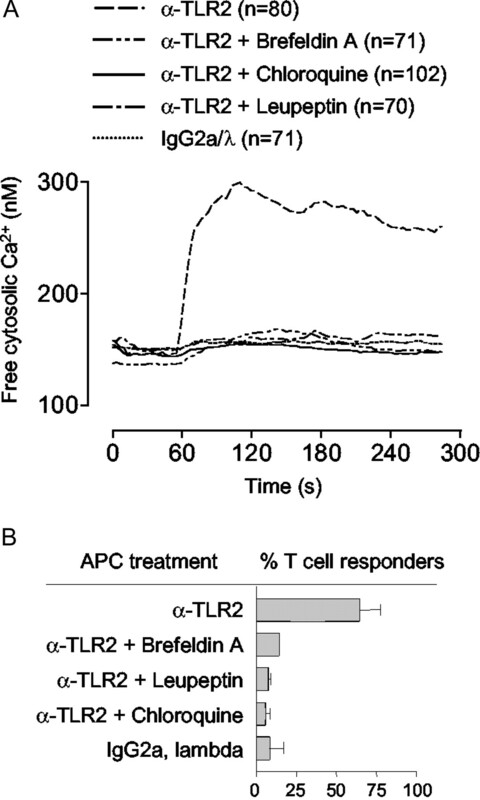 We found that incubation of freshly isolated monocytes with TLR2-specific mAb (TL2.1) induced a rapid increase of free cytosolic Ca2+ in the Cκ-specific T cells. Control mAb with the mouse L chain of another isotype (λ2) failed to induce any response. The responses were almost completely abrogated by chloroquine, leupeptin, and brefeldin A (p < 0.01; Fig. 3⇓A), as was the fraction of responding T cells (p < 0.01; Fig. 3⇓B). These findings indicate that the Cκ epitope is dependent on intracellular proteolysis in acidic vesicles before loading onto newly synthesized MHC class II molecules. Thus, mAb specific for TLR2 appear to be endocytosed and processed by the APC via the conventional pathway for MHC class II presentation to CD4+ T cells. TLR2-specific mAb needs intracellular processing for presentation on MHC class II molecules to Cκ-specific CD4+ T cells. TL2.1 (100 μg/ml) was added to a semiconfluent layer of monocytes in the presence or absence of brefeldin A, chloroquine, or leupeptin. After 4 h at 37°C and washings, Cκ-specific T cells loaded with fura2-AM were allowed to sediment onto the layer of mAb-pulsed monocytes. Images of cytosolic free calcium in single T cells were recorded and analyzed. A, Time course represents mean of free cytosolic calcium in all single T cells (n) contacting APC treated with mAb and inhibitors as indicated. B, Fraction of Cκ-specific T cells giving a response 100 nM above their individual basal Ca2+ level. The results described above strongly suggest that mAb binding TLR2 are internalized and enter the conventional endosomal MHC class II presentation pathway for processing and presentation. To demonstrate internalization into endosomes, HEK293 cells stably transfected with TLR2 were transiently transfected with FYVE-GFP, which stains specifically early endosome Ag 1 in early endosomes. 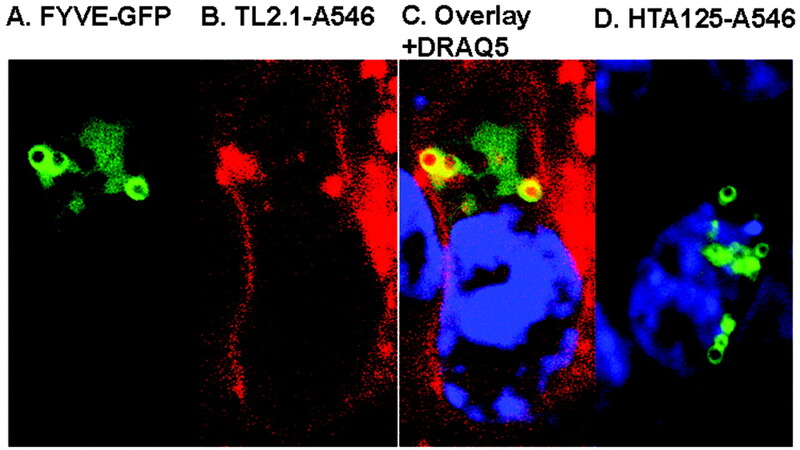 When such doubly transfected cells were exposed to Alexa546-labeled TLR2-specific mAb (TL2.1) at 37°C for 45 min, TLR2-specific mAb was observed inside FYVE-GFP+ endosomes by confocal microscopy (Fig. 4⇓C). Using an isotype-matched Alexa546-labeled TLR4-specific mAb (HTA125) gave no signal, demonstrating the specificity of the staining (Fig. 4⇓D). Consistent with these data, we identified a likely internalization motif (bold letters) (16) LLEPIEKKAIPQRFCKL (aa 736–752) localized within the cytoplasmic domain of TLR2. TLR2-specific mAb is internalized into endosomes. HEK293 cells stably expressing TLR2 were transiently transfected with FYVE-GFP before incubation with Alexa546-conjugated TLR2-specific mAb (TL2.1) at 37°C for 45 min. Cells were analyzed by confocal microscopy. A, FYVE-GFP which stains early endosome Ag 1 in early endosomes; B, Alexa546-conjugated TL2.1; C, overlay of A and B with DRAQ5 staining; and D, overlay of FYVE-GFP and isotype-matched control Alexa546-conjugated HTA125 with DRAQ5 staining. It is difficult to investigate whether PRR, like TLR2, deliver ligands for presentation on MHC class II molecules. This is partly due to the redundancy among PRR and their natural ligands and lack of T cell read-outs. In addition, natural ligands for TLR2 have been demonstrated to induce DC maturation as indicated by up-regulation of CD80, CD86, and MHC class II molecules (2, 3, 4), as well as by increased capacity to stimulate allogenic T cells in MLR (3, 4). As part of this APC maturation, TLR2 activation induces secretion of the inflammatory cytokine TNF-α, which recently has been shown to increase the activity of cathepsin S and B in human DC and to increase stable MHC class II formation (17). Therefore, when using natural ligands to target TLR2, two factors could contribute to enhanced T cell responses: 1) increased APC function and 2) enhanced peptide loading of MHC class II molecules. To circumvent these problems, we have in the present study used an alternative ligand for TLR2, namely, an antagonistic anti-TLR2 mouse mAb (TL2.1) with κ L chains. Because this mAb is specific for TLR2, the problem of redundancy is avoided. Moreover, this mAb did not activate APC or induce maturation, as judged by a failure to induce secretion of TNF-α and IL-6 and up-regulation of CD80, CD86, and MHC class II molecules on monocytes and DC. Therefore, the 100- to 1000-fold increase in potency at stimulating Cκ-specific CD4+ T cells is most likely due to enhanced MHC class II presentation and not enhanced APC function as a consequence of TLR2 engagement. Consistent with this, TL2.1 mAb bound to TLR2 was internalized into the endocytic pathway where MHC class II molecules are found. Moreover, Ag processing and presentation were inhibited by chloroquine, leupeptin, and brefeldin A. These results strongly suggest that endocytosed TLR2 ligands intersect the conventional MHC class II pathway for loading of newly synthesized MHC class II molecules. It could be that an agonistic TLR2-specific mAb (not been described) would yield even better T cell stimulation than the antagonistic TL2.1 mAb used herein, because increased APC function would further augment T cell responses. Hence, it is likely that channeling of TLR2 ligands into the MHC class II presentation pathway and concomitant up-regulation of APC function could act synergistically in stimulation of (naive) T cells. How does the present study extend to natural ligands for TLR2? MHC class II molecules bind peptides, some of which may be glycosylated, for presentation to CD4+ T cells. Lipopeptides and peptidoglycans, natural ligands for TLR2, are thus expected to yield peptides that may be presented as such on MHC class II molecules. By contrast, nonprotein TLR2 ligands, such as lipoteichoic acid, are not expected to be presented by MHC class II molecules. However, these latter ligands often exist as integral parts of bacterial cell walls. Such complex structures may be endocytosed via TLR2, processed, and peptides derived from a diversity of bacterial proteins could be loaded onto MHC class II molecules, resulting in pathogen-specific CD4+ T cell responses. Based on the present findings, targeting Ag to TLR2 could be an effective strategy for the development of Ab-based vaccines. We have previously described recombinant Ab, called Troybodies, which have V regions specific for surface molecules on APC and T cell epitopes introduced genetically into the C region (18). The T cell epitopes replace loops connecting β strands in the CH1 domain and do not abolish Ab folding, secretion, or APC targeting. IgD- and MHC class II-specific Troybodies were 1000-fold more potent at inducing specific CD4+ T cell responses compared with non-APC-specific peptide Ab (19, 20). For Troybodies and other methods of Ab-mediated delivery of Ag to APC, it is crucial to define optimal surface receptors to target. The surface receptor targeted must intersect the MHC presentation pathways, ligation of the surface receptor should provoke an inflammatory response and recruitment of immune cells to the vaccination site, and, finally, engagement of the surface receptor should induce APC maturation, thus turning the APC into potent stimulators for T cells. Targeting TLR2 on monocytes or immature DC by agonistic recombinant Ab could fulfill all of these requirements. TLR2 is a PRR that may accommodate at least two functions: It is a signaling receptor in innate immunity, leading to secretion of inflammatory cytokines critical in innate immunity (2) and up-regulation of MHC class II molecules and costimulatory molecules (2, 3, 4). The present study indicates that it is also an endocytic receptor that channel ligands into the MHC class II presentation pathway for stimulation of specific CD4+ T cells. Consequently, TLR2 expressed on APC could regulate both innate and adaptive arms of antimicrobial immunity and be effective target for vaccines. We thank Kristin L. Sand, Nicole Sessler, and Agnete Brunsvik for excellent technical assistance. Endotoxin levels were kindly measured in Prof. Peter Kierulf laboratory by Dr. Kari Bente Foss Haug at Ullevaal University Hospital. ↵1 This work was supported by research grants from the Research Council of Norway and the Norwegian Cancer Society. ↵3 Abbreviations used in this paper: TLR, Toll-like receptor; DC, dendritic cell; PRR; pattern-recognition receptor, HA, hemagglutinin; Pam3Cys, tripalmitoyl-S-glycerylcysteine; fura2-AM, fura2-acetoxymethyl ester; GFP, green fluorescent protein.